Secundum atrial septal defect (ASD) is a common type of congenital heart disease. An electrocardiogram (ECG) is useful in the diagnosis of ASD. The characteristic ECG patterns of secundum ASD include right bundle-branch block (RBBB), right axis deviation (RAD), isolated negative T wave, and/or rod/stroke (R/S) ratio in lead V5. Notched R waves in the inferior ECG limb leads represent a “crochetage pattern” and were first reported in 1959.1) Heller et al. defined the crochetage pattern as a rapid up-and-down motion of the R wave on its ascending branch or near its zenith, with an M-shaped or a bifid pattern in the most typical form, and the initial 80 ms of the QRS complex in the II, III, and aVF leads is always observed.2) The crochetage pattern is a characteristic finding of ASD in children.3) It is believed that the ECG changes in ASD are caused by right ventricle volume overload, but findings are not necessarily consistent with the right ventricle end diastolic volume index (RVEDVI) or pulmonary/systemic blood flow ratio (Qp/Qs).4, 5) Therefore, the crochetage pattern can also be observed in patients with patent foramen ovale or pulmonary stenosis, or even in patients without any pathology.3, 6) The cause of the crochetage pattern still remains unknown. Given that the crochetage pattern occurs as a notch of QRS in the inferior limb leads, we hypothesized that the crochetage pattern is associated with the direction of right ventricular stretch in ASD patients. The aim of this study was to determine whether the crochetage pattern is associated with the direction of right ventricular stretch. We conducted a retrospective study of patients with congenital heart disease (age, 1–21 years) who underwent cardiac catheterization in the Department of Pediatrics of Asahikawa Medical University Hospital between January 2013 and December 2016. The patients were divided into two groups: eight ASD patients with the crochetage pattern (median age, 6.0 years) and eight ASD patients without the crochetage pattern (median age, 11.5 years). The data from these patients were compared with those of a control group, which included eight patients with a history of Kawasaki disease, postoperative aortic coarctation, or postoperative interrupted aortic arch (median age, 10.0 years). None of the patients in the control group had right ventricle volume overload. 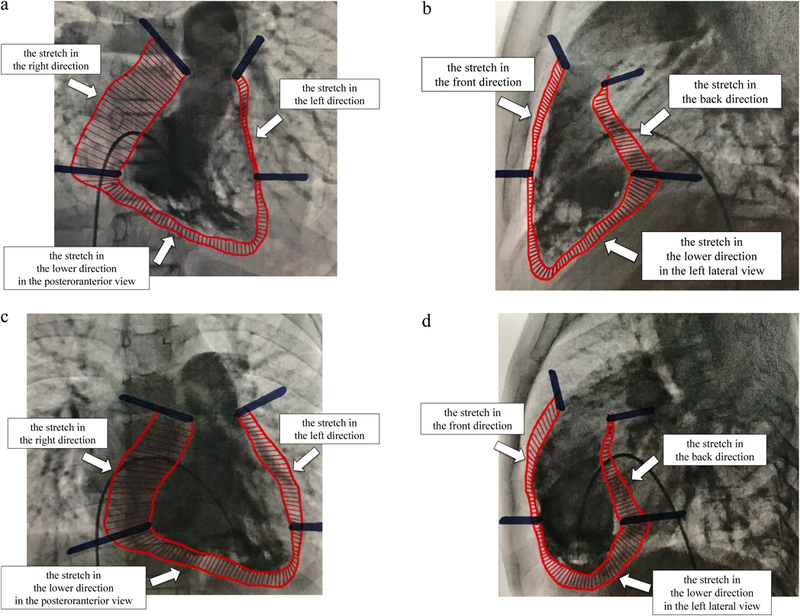 We excluded patients with ostium primum defect, patent foramen ovale, partial anomalous pulmonary venous connection, and pulmonary hypertension. Informed written consent was obtained from the patients or their parents prior to catheterization. This study was conducted in accordance with the ethical guidelines of the 1975 Declaration of Helsinki and was approved by the Institutional Review Board. The patients underwent cardiac catheterization for the evaluation of their hemodynamic parameters. Cardiac catheterization was performed under the same anesthesia protocol for all patients, which included intravenous infusion of thiopental and midazolam, blood sampling for measurement of oxygen content (SaO2), measurement of cardiac index (CI), and Qp/Qs. The oximetry data were used to calculate intracardiac blood flow using the Fick’s principle. Right ventricular volumes were calculated from biplane cineangiocardiograms and expressed as percentage of normal values.9) The right ventricular volume was measured using the Graham method. The stretch values were calculated to determine how the right ventricle progressed between systole and diastole (Fig. 2). The stretch values were calculated as follows: We subtracted the right ventricle systolic area from the right ventricle diastolic area in posteroanterior (PA) and left lateral (LL) views on right ventricle angiography and using Cardio Agent analysis software (Toshiba Medical Systems Corporation, Tochigi, Japan). We divided the area into three parts at the position of the tricuspid valve and the position where the line drawn horizontally from the tricuspid valve on the free wall side intersects with the right ventricle. Then, we calculated these areas using ImageJ v1.33, downloaded from the NIH website (http://rsb.info.nih.gov/ij). We corrected the obtained data according to the body surface area (BSA). The stretch was measured in six directions: in the right, lower, and left directions in the PA view; and in the front, lower, and back directions in the LL view. A representative image showing the differences between controls and ASD patients with the crochetage pattern is shown in Fig. 3. Fig. 3a and 3b are control images and 3c and 3d are images showing ASD with crochetage pattern. To ensure the reproducibility of our methods, we examined intraobserver and interobserver differences in stretch values. There was good correlation between intraobserver and interobserver values (r=0.994 and r=0.996, respectively). All parameters were expressed as mean±standard deviation, except for age, which is expressed as median value. A Spearman’s rank correlation coefficient was used to assess the correlations between the various parameters. Statistical differences were determined using a Kruskal–Wallis test. A p-value of <0.05 indicated statistical significance. The obtained data were corrected using a Bonferroni’s correction. A multivariate stepwise linear regression analysis was performed to determine the effects of stretch values and hemodynamic data. Statistical calculations were performed using the Statistical Package for the Social Sciences version 24.0 (IBM Corp., Armonk, NY, USA). Table 1 shows the characteristics of the patient groups. Among the three groups, no significant differences were observed in terms of gender, age, BSA, and CI. RBBB was found in five (62.5%) and three (37.5%) ASD patients with and without the crochetage pattern, respectively. RAD was found in one (12.5%) ASD patient with the crochetage pattern, RAD was not found in any of the ASD patients without the crochetage pattern. Isolated negative T wave and R/S <1 in lead V5 were each found in one (12.5%) ASD patient without the crochetage pattern, whereas five (62.5%) ASD patients with the crochetage pattern had isolated negative T wave, but none had R/S <1 in lead V5. In ASD patients with the crochetage pattern, the patterns were detected in III and aVF in eight (100%) and seven (87.5%) patients, respectively; however, none of the ASD patients with the crochetage pattern had notched R waves in lead II. 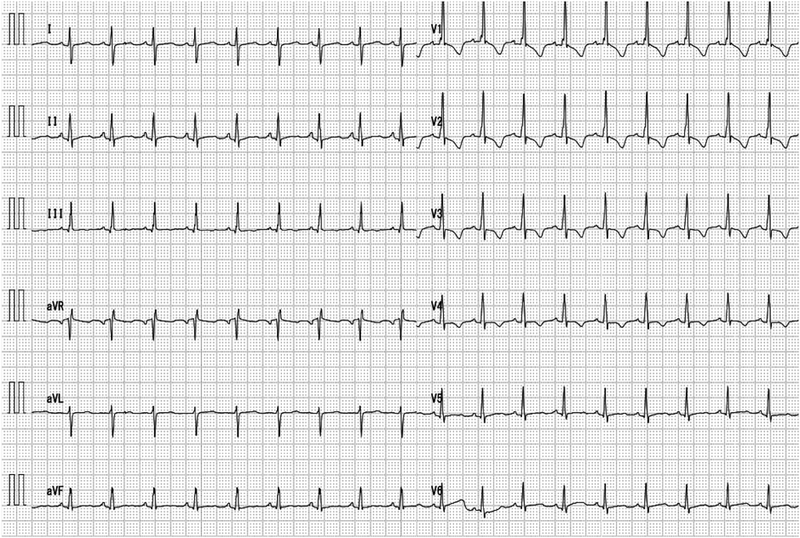 None of the control subjects had RBBB, RAD, isolated negative T wave, R/S <1 in lead V5, or the crochetage pattern. Right ventricular ejection fraction (RVEF) in the patients with the crochetage pattern was significantly lower than that in the control subjects. Qp/Qs and RVEDVI were significantly higher in the ASD patients than in the control subjects. However, the patients with the crochetage pattern did not have significantly higher Qp/Qs and RVEDVI than those without the crochetage pattern (Qp/Qs: 2.77±0.72 vs. 2.02±1.06, p=0.55; RVEDVI: 112.8±17.6 vs. 112.7±15.0 mL/m2, p=1.00). Among the 16 patients with ASD, only one patient in the ASD group without the crochetage pattern was not treated. * p<0.05 vs. control, ** p<0.01 vs. control, † p<0.05 vs. ASD without the crochetage pattern. All parameters are expressed as mean±standard deviation, except for age, which is expressed as median. ASD, atrial septal defect; BSA, body surface area; CI, cardiac index; CRBBB, complete right bundle-branch blocks; IRBBB, incomplete right bundle-branch blocks; LL, left lateral; PA, posteroranterior; Qp/Qs, pulmonary/systemic blood flow ratio; RAD, right axis deviation; RVEDVI, right ventricle end diastolic volume index; RVEF, right ventricular ejection fraction; R/S, rod/stroke. Fig. 4a–f shows the correlation between Qp/Qs and the stretch values with the corresponding direction in the PA and LL views. There was a strong correlation between Qp/Qs and the stretch values in the left direction in the PA view (r=0.818), and in the front and lower directions in the LL view (r=0.755 and r=0.679, respectively). 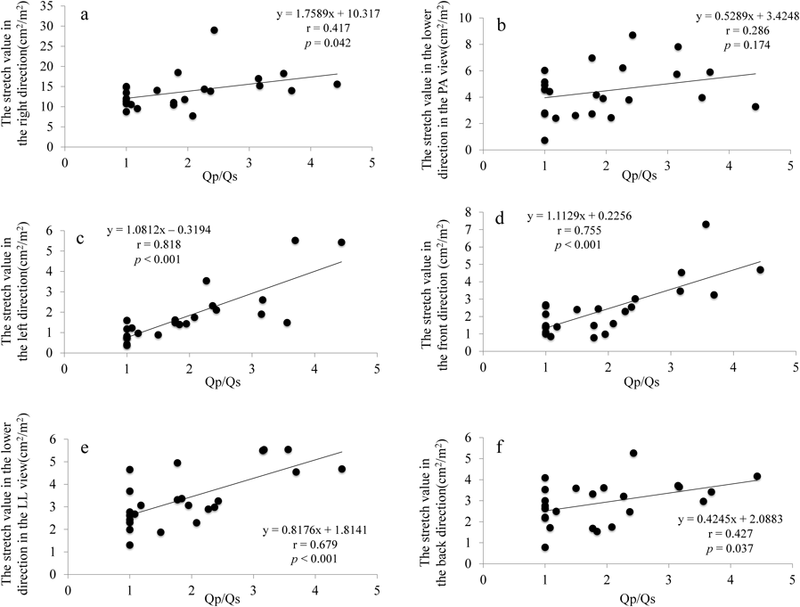 There was no correlation between Qp/Qs and the stretch values in the right and lower directions in the PA view (r=0.417 and r=0.286, respectively), or in the back direction in the LL view (r=0.427). No significant between-group differences were observed in the stretch values in the right, front, and lower directions in the LL view, or the stretch value in the back direction (Fig. 5a, d–f). The stretch value in the lower direction in the PA view was higher in eight ASD patients with the crochetage pattern (5.97±2.02 cm2/m2) than in eight ASD patients without the crochetage pattern (3.42±0.77 cm2/m2, p=0.017) (Fig. 5b). The stretch value in the left direction in the PA view was higher in the ASD patients with the crochetage pattern (2.57±1.37 cm2/m2) than in the control subjects (0.83±0.40 cm2/m2, p<0.001) (Fig. 5c). Table 2 shows the results of the univariate and multivariate analyses of the effects of the hemodynamic findings and the stretch values according to directions on the number of crochetage patterns. On stepwise multivariate analysis, Qp/Qs and the stretch value in the lower direction in the PA view were statistically significant independent predictors of the number of crochetage patterns (p=0.01). In the ASD patients, only the stretch value in the lower direction in the PA view was a statistically significant independent predictor of the number of crochetage patterns (p=0.006). This study is the first to investigate the stretch direction of the right ventricle as a finding associated with the crochetage pattern in ASD patients. The stretch value in the lower direction in the PA view was higher in ASD patients with the crochetage pattern than in those without the crochetage pattern. Given that the crochetage pattern is an R wave notch in the inferior ECG limb leads, we believe it is reasonable that a significant difference is present between ASD patients with and without the crochetage pattern. It is possible that the stretched right ventricular muscles are an obstacle to electrical conduction, resulting in a crochetage pattern on the ECG. Conversely, because the extension in the lower direction appears strong along with the left direction when the right ventricle volume overload is large, we believe that reproduction of the crochetage pattern is easy. Previous studies have reported the presence of the crochetage pattern in patients with right ventricular volume overload.5) Considering only RVEDVI and Qp/Qs, the crochetage pattern may easily occur. However, by taking into consideration the stretch direction of the right ventricle, it is understood that the crochetage pattern does not occur only due to the right ventricle volume overload. Even if RVEDVI or Qp/Qs is large, the chrochetage pattern may not occur. In particular, the crochetage pattern is less likely to occur if the right ventricle is expanded and only stretched in the left direction. Therefore, ASD patients might not necessarily show the crochetage pattern. On the contrary, a crochetage pattern indicates that the stretch value in the lower direction is significant even if there is minimal right ventricle volume overload. Therefore, it is feasible that patients with patent foramen ovale, pulmonary stenosis, or normal hearts can also have this pattern. However, it is still unclear why the stretching of the right ventricle in the lower direction produces this pattern in such patients. Thus, future studies investigating the stretch value of the right ventricular myocardium using echocardiography or magnetic resonance imaging are warranted; determining which part is likely to be related to the crochetage pattern also needs to be investigated. In addition, the clinical significance of the crochetage pattern may be determined by the duration of functional changes in the right ventricular myocardium. This study had some limitations. First, the stretch value was defined by us and is not a well-known value. Second, our patient sample size was small, and the three groups had different age groups. There are some reports that the crochetage pattern is more frequently seen in younger people.3) Even in this study, the patients with the crochetage pattern were relatively younger than those in the other groups. Perhaps, the myocardium of a young person is softer than that of adults, and the stretching of the myocardium tends to occur in the lower direction. Third, since there were cases of CoA and IAA postoperatively in the control group, it was undeniable that the abnormality of cardiac function may be affected. Fourth, none of the ASD patients with the crochetage pattern had notched R waves in lead II. Fifth, our patient sample did not have strong RAD. Thus, we think that the stretching of the right ventricular changes in direction based on the severity of RAD. For these reasons, further studies are needed. In the ASD group, the right ventricle was easily stretched in the left and front directions in the PA and LL views, respectively, compared to that in the controls. In cases with large extensions of the right ventricle in the lower direction in the PA view, the crochetage pattern does occur. The stretch value in the lower direction of the right ventricle was associated with the crochetage pattern in ASD patients. The families of the patients described provided informed consent for the study of the children.